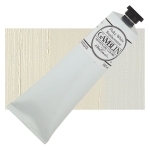 Gamblin was the first to develop Flake White Replacement, a color true to the properties of traditional Flake White but completely free of lead. Flake White Replacement offers a beautiful opalescence, a long and ropey stroke, warm colors, translucency, and a short, sharp brush mark. In addition to being lead-free, Flake White Replacement is also more permanent than Flake White, due to a slower drying time that reduces the risk of cracking.